Keegan-Michael Key and Jordan Peele, the duo behind the sketch show Key & Peele, might be the greatest comedic duo today. Their skits address race, social mores, and film and television cliches in ways that have make it clear they’re sharp social satirists–but they throw in plenty of absurdity. At the Los Angeles Film Festival, Elvis Mitchell sat down with the pair to discuss their show, their writing style, and their influences. As part of the chat, the duo presented three sketches that influenced them. Peele spoke of how sketch, drama, or any kind of writing often utilizes conflict, but in real life people go out of their way to avoid conflict. This sketch maximizes that tendency for its humorous effect. The same thing can be seen in “Phone Call,” the first Key & Peele sketch, which they call the thesis statement for the series. This sketch was designed by The State as a middle finger to the executives who requested that the troupe add a recurring character with a catchphrase to its roster. 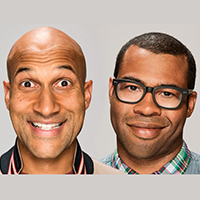 One of Key and Peele’s many goals was to avoid using catchphrases (or recurring characters, though they have sparingly incorporated them as the show has gone on). In their show, Key and Peele have a knack for taking something familiar and twisting it into something new. It’s a strategy that continues to serve them well as they go into their fourth season, which will begin airing sometime in the fall on Comedy Central. Until then, here are their thoughts on the finer points of making people laugh.